Viraj Refinery Sangli (Viraj Alcohols & Allied Industries),Sangli Published Job Notification for 05 Plant In Charge & Shift In Charge Posts. 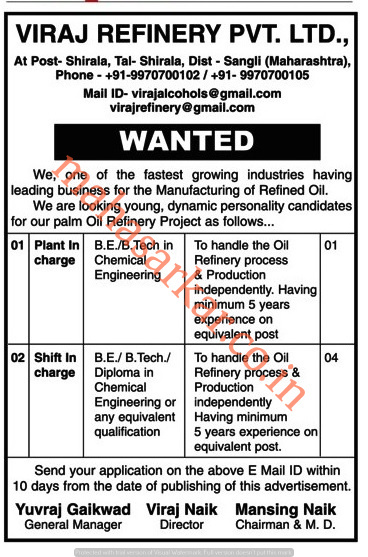 Candidates who wish to apply must look at Viraj Refinery Sangli Plant In Charge & Shift In Charge Recruitment 2018. Eligible candidates can apply Online before 24-02-2018. Education Qualification: BE/ B.Tech/ Diploma and More. For Post wise Education Details follow the detailed advertisement. Starting Date, Last Date to Apply Online at Viraj Alcohols & Allied Industries which candidates should be remembers as follows. Start Date to Apply Online: 14-02-2018. Last Date to Apply Online: 24-02-2018.